Stamps and Stitches: Merry Christmas!! I hope everyone who celebrates it had a nice Christmas (and even those who don't celebrate it-I hope you had a nice December 25th). I've been holding off on posting my Holiday cards so I'm going to post them here all at once. I only made 5 different ones this year. 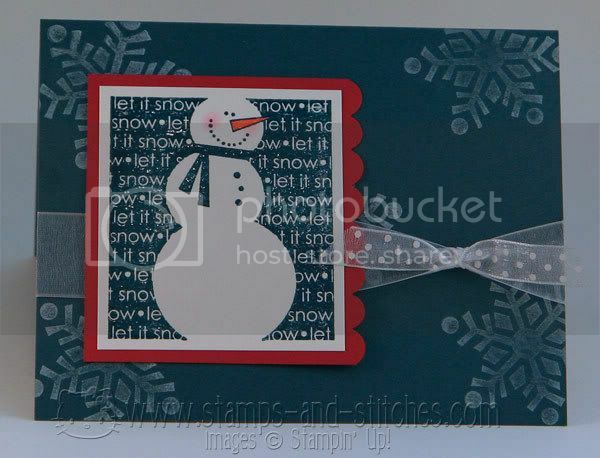 stamp set: Two Cool Dudes from SU, Not Quite Navy craft ink and cardstock, Whisper White craft ink, Real Red cardstock, Stampin Up scallop edge punch, ribbon unknown, clear embossing powder, SU chalk for the cheeks and I used an orange zig marker for the nose. 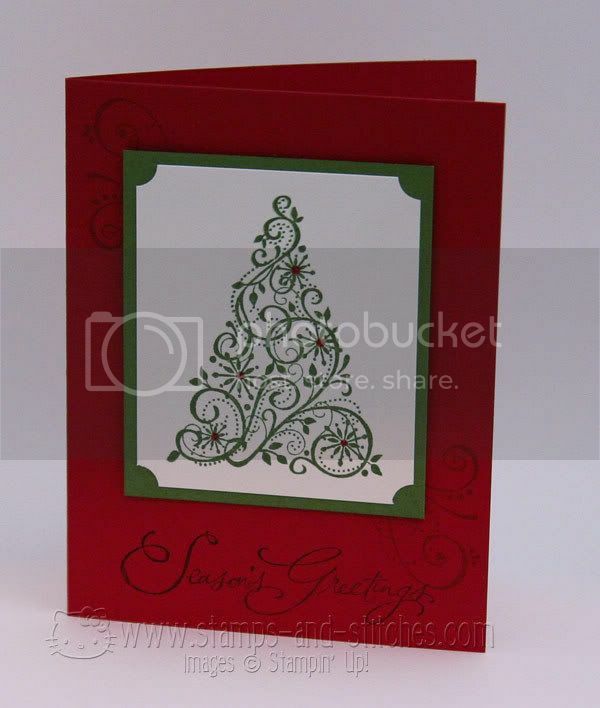 The white is shimmery cardstock (not SU but the same). I *think* this was Ballet Blue cardstock, Snowflake cuttlebug embossing folder, Whisper White craft ink (rubbed over the snowflakes), Cricut snowman from Doodlecharms, hat from Paper Doll Dress up, Stickles for the hat band, rick rack for the scarf, you can't see it but there's diamond dust paper on the buttons, and I used an orange copic marker to color the noses (instead of cutting out separate noses from orange paper). 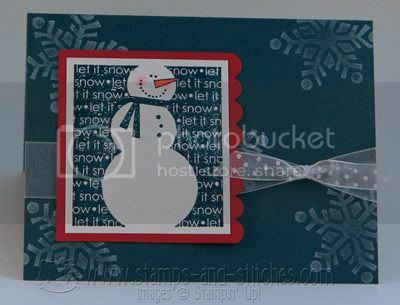 Stampin Up chalk for the cheeks. 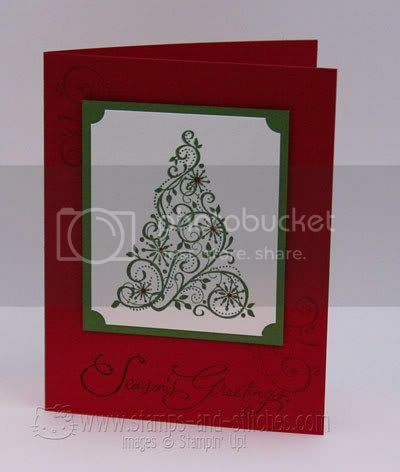 The white card base is made with Paper Trey Ink white cardstock. 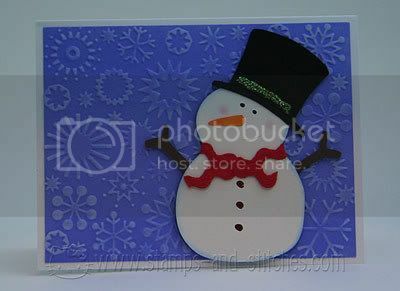 The snowmen are cut from shimmery white cardstock and Chocolate Chip cardstock. 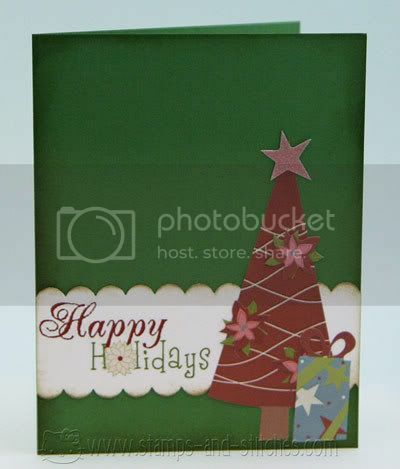 Real Red and Garden Green cardstock, shimmery white cardstock, Garden Green ink, red stickles for the dots on the tree, Snow Swirled stamp set, Many Merry Messages stamp set, Priceless stamp set (for the swirls-it's hard to see them), burgundy ink (I can't remember which burgundy but I think it was the older retired color), ticket corner punch. Garden Green cardstock, shimmery white cardstock, stickers and rubons from Imaginisce, Tim Holtz distressing ink, Stampin Up scallop edge punch. 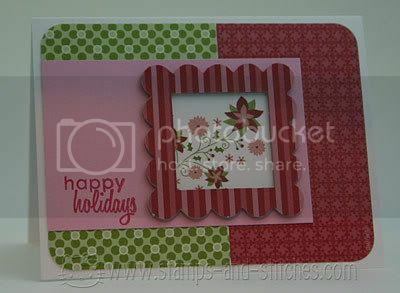 White cardstock from Paper Trey Ink, Pretty in Pink cardstock, Stampin Up patterned paper and chipboard frame (from the Country Living bundle), shimmery white cardstock, Imaginisce rubon, and the greeting stamp is from the Take a Bough set from Paper Trey Ink and I used Real Red craft ink to stamp it. 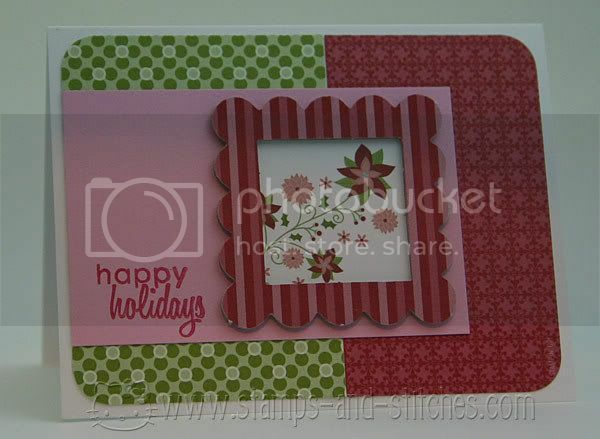 Also used a Creative Memories corner rounder punch. I never posted the ones I made last year so I'll post those in the next week or so. Wow all of these are just amazing looking and so wonderful....I'm so glad christmas is behind me now I just need all my company to head home...lol so I can get back to something kind of normal again!!!! Love them all! I think that I will be making different cards next year for Christmas. I usually get tired of making the same one over and over again. Adorable cards!! I love the one with the triangle Christmas tree. Wow Gale, those are seriously the most beautiful cards I have ever seen! You are so darn creative! Great card assortment! I love the different colour combos!